My sweet group of friends meet on the last Sunday of each month. We get together and sew for the day. We all bring a few things for show and tell. Eat delicious food, sit and sew and chat. Each working a different projects, sharing lots of ideas about quilting, health related issues, kids, you name, we talk about it. This time I brought a nice little quilt that I made from the April issue of American Patchwork and Quilting for my show and tell. It's called Pink Lemonade. My 29th Birthday Party ~ Again!! My two daughter's came home and made a lovely dinner for me for my birthday. They started cooking at 5:30 and dinner wasn't ready until 8 pm. They can't figure out how I manage to get everything done at the same time and be able to sit down to a nice dinner. I told them that I have been doing it for 25 years so I better know how by now. One of my daughters loves to be in the kitchen and the other could care less. I think the latter just did the dishes. Unfortunately my son is in sumer school and couldn't come home the the weekend. 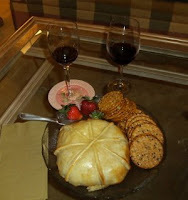 We had cornish game hens, a fantastic carrot ginger soup and our appetizer was a delicious warm baked brie round with walnuts and honey inside. 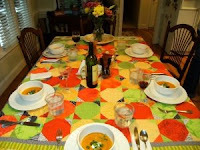 They also put one of my favorite quilts on the table for my tablecloth. It's called Salsa Snowballs. I am going to put some kits in my store just as soon as I can find the time to make them up. I found this wonderful, sweet, inspiring blog that I want to share with you. It's called The Great Hexagon Quilt Along. I didn't realize that so many others like me are hooked on hexies. 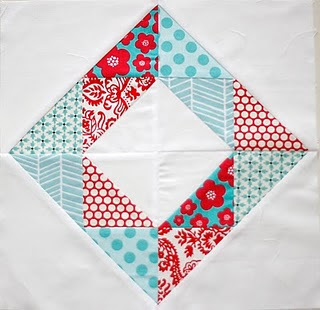 I am so inspired to see everyone's wonderful quilts, storage ideas and works in progress. I got hooked on hexies coming home from The International Quilt Festival in Houston last year. I started working on them in the airport waiting for my flight home. I used up all my foundations and finished them all in the airplane. It seems like I am using a different method then most people use. I use english paper piecing foundations. I know there is a lot of extra steps in the method that I am using, so maybe for my next one I will use freezer paper. 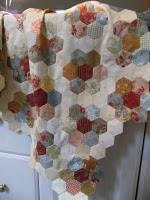 I am using all Moda fabrics from various fabric collections and a variety of creams for my connecting hexies. It's gonna be a soft and scrappy one. I think I will be a grandmother before I ever get it done though. Just finished this pretty quilt up on Friday. It's one of Bonnie Hunter's from Quiltville.com. The greens are from the strip exchange that I participated in. Somewhere back in my blog I mentioned that my husband pays to get my quilts quilted by my local long arm quilter. Well, he saw this quilt and said he loved it. He wants this one and said it's a keeper. Then he said, "Did you notice that some of your blocks don't match up too well? I said "Who made you the Quilt Police? I love him anyway. My Sweet Amy Butler "Fly Away Home" Quilt on my kitchen table at sunset. I always have a quilt on my kitchen table. I thought this was sort of pretty this evening when I sat down for dinner. The sun was coming through the window you could really see the detail on the quilting of my flying geese. I'll tell you though, this was a tough quilt to make. Not being so accurate with a 1/4 seam. This was a real challenge to get this quilt straight. It turned out so wonky. I chopped a bunch of geese off and the gal that I use to quilt my quilts did a fantastic job of hiding all my mistakes.